When your pregnancy, what you eat doesn't just affect you but your baby as well. You want to eat foods that are the most nutritious like whole grains, vegetables, lean proteins and fruits while avoiding shellfish and undercooked meats. While pregnant women are encouraged to eat more fruits, there are some fruits that you'll want to avoid, one of which is papaya. Why is papaya in pregnancy a concern? Read on to learn more. Is Papaya Safe to Eat During Pregnancy? Papain in unripe papaya will slow down cell growth and tissue development in the fetus. This slowing down and weakening of the vital membranes may result in a small chance that the fetus will survive. Papaya is used in many cultures as a natural contraceptive. Consuming papaya in pregnancy can have negative effects on the developing fetus. Papaya that is unripe increases the pressure on the blood vessels, slows down blood circulation and can cause fluid retention. These all have a negative effect on pregnant women. The excess pressure on blood vessels increases the risk of bleeding in the placenta while the fluid retention causes more pressure on the blood vessels, causing blood to pool and increasing the risk of internal hemorrhaging. Even semi-ripe papaya can cause uterine contractions which trigger premature labor. In the early stages of pregnancy, papaya should be avoided to decrease the risk of miscarriage. The enzymes in papaya, chymopapain and papain, are types of abortifacients and teratogens. Abortifacients can cause abortions and teratogenics have a negative effect on the growth of the fetus. 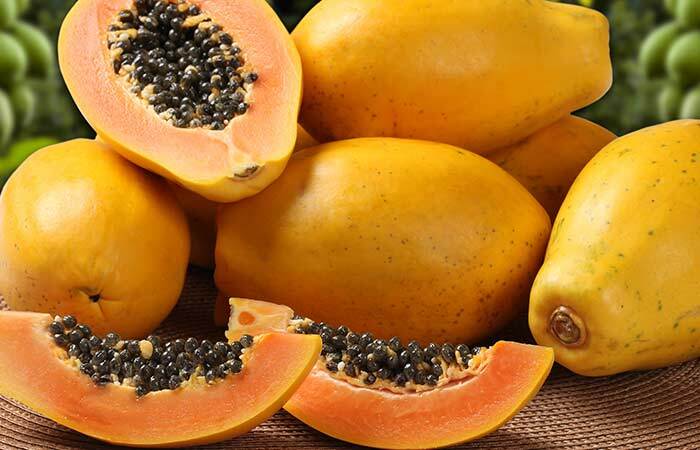 The combination of pepsin and papain in papaya can negatively affect the growth and development of the fetus. The effect of papaya in pregnancy when the papaya is unripe increases the chance of post-implantation loss or embryotoxicity. Papaya is often used to help relieve constipation naturally because of its high fiber content. When pregnant, an increase in bowel movements can increase the pressure on the uterus which can result in miscarriages. The papain in papaya can cause allergic reactions. Individuals who consume a lot of papaya will often have respiratory issues like nasal congestion, asthma, wheezing and difficulty breathing. When you are pregnant, this breathing difficulty means the fetus is not receiving enough oxygen. The high content of vitamin C in papaya can make it dangerous to consume while pregnant. When you consume too much vitamin C, it will metabolize and produce oxalate build up, resulting in kidney stones. These kidney stones can cause stomach cramping and additional pressure on the abdomen. Papain can increase the risk of vaginal bleeding while pregnant, which is never a good sign. The beta-carotene in papaya can cause the skin to become discolored. This skin discoloration, also known as carotenemia, can only be avoided or treated by eliminating papaya from your diet. The leaves and seeds of papaya contain carpine which is toxic. Consuming these can damage the nervous system. Papaya in pregnancy is not recommended because of the reasons listed above. Aside from papaya, there are additional fruits you may not be aware of that you should also avoid while pregnant. Women in their third trimester should avoid eating grape - this includes raisins. The heat content of grapes can have a negative effect on the mother and baby if consumed and this can be further explained by your gynecologist. The Bromelain in pineapple can cause the cervix to soften. When the cervix is softened, this can increase the risk of early labor. Consuming a large amount of pineapple can also cause diarrhea, increasing the risk of dehydration.